Putting this together put me in such a happy mood! I may or may not have been singing "Brighter Than Sunshine"
You look great in yellow, being blonde I find it really tricky to get right but still adore the almost neon shades. Whilst I am reluctant to wear bright neon at my age, I do love the colour for a handbag (the DVF is fabulous) a belt or heels. 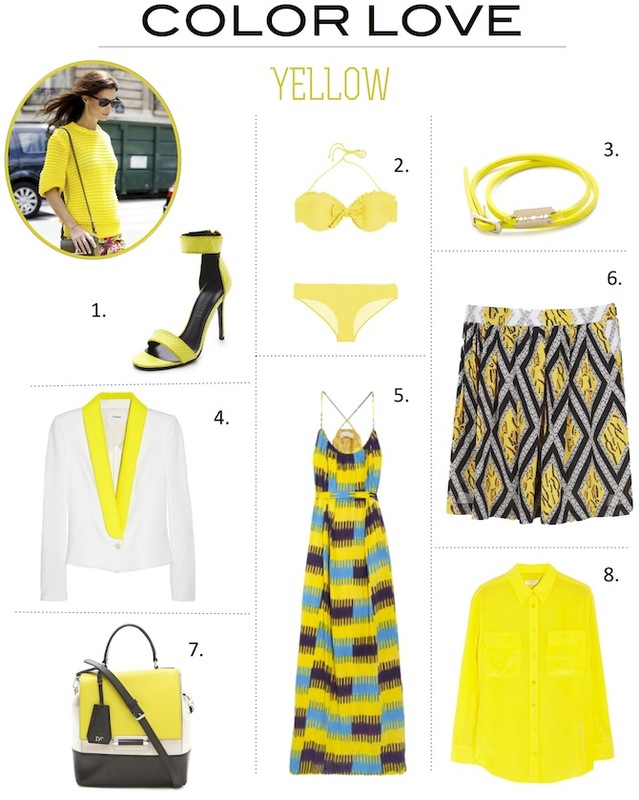 I'm not usually a bright color kind of gal, but with pieces like numbers five and seven, well I think I could make an exception! P.S. there is never an item in your collection board posts that I don't like. Well done! These bits of yellow just make me happy! i love wearing yellow. love, love, love! LOVE the yellow swimsuit and white blazer with yellow trimming! Too cute! Yellow is such a happy color, I love to wear it. Great finds! That blazer with the neon lapel is amazing! I love yellow! What a great post.